In Libya, Muammar Qaddafi (pictured above) has been Top of the Pops for 41 years. Although he's hanging on to that spot by a thread, he now has an accidental new career as the singer (Auto-Tuned, of course) of perhaps the most viral video of the moment. Could "American Idol" be in his future? 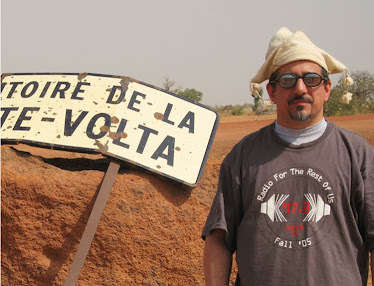 On the off chance that you haven't heard it yet, tune in to Global A Go-Go this week for "Zenga-Zenga" and other music from the hot spots of North Africa. Also on this week's show: brand new globally-aware music from the USA by The Sway Machinery (of New York), Sampa Mapangala (now living in Maryland) and Rattlemouth (from right here in Richmond); Ethiopian music performed extremely well by non-Ethiopians; Congolese classics by Zao and Franco & Sam Mangwana, and as always much more.